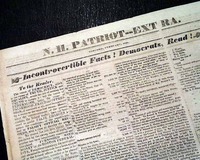 Just below the dateline is "Incontrovertible Facts - Democrats, Read ! " with most of the content being politics and finance reports. Four pages, very nice condition. This is a single-page print. 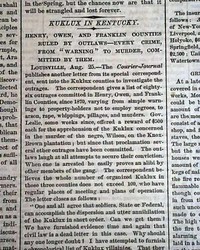 The page contains two engravings entitled "Landing of Ohio Troops at Louisville, Kentucky" and "General Buell's Body-Guard". The print size is approximately 11 x 15.75 inches. 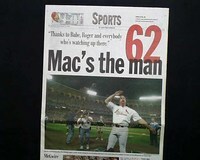 ST. LOUIS POST-DISPATCH, Missouri, September 9, 1998 See the photo for a terrific & very displayable headline: "JUBILATION" celebrating Mark McGwire 62nd home run of the season, breaking Roger Maris' home run record. Great to have in a St. Louis newspaper! 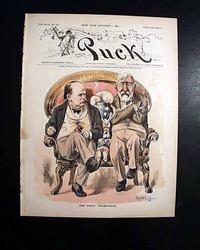 This is the complete issue and is in very good condition with only a slight even toning. BEACON, Philadelphia Navy Yard, 1944 A military paper produced at the Navy Yard, which was a major site for not only the building of new warships but also the repair of vessels damaged in the war. 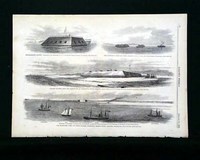 As would be expected there is a great wealth of war-related content, with an emphasis of naval items. 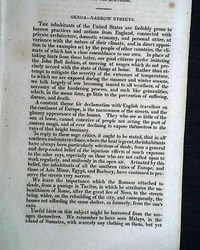 THE JOURNAL OF HEALTH, "Conducted by an Association of Physicians" as printed in the masthead, Philadelphia, September 28, 1831 Among the articles within are: "The Russian Cholera"; "Causes of the Epidemic Cholera"; "Syrp of Milk"; "The Acclimating Principle of Plants"; "The Pleasures of a Canter"; & more. 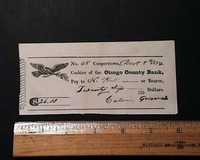 This is a genuine check written on the "Otsego County Bank" of Cooperstown, New York dated 1834. Included is the amount in the lower left corner with a signature in the lower right. There is a nice engraving of an eagle with an olive branch in its beak (see). 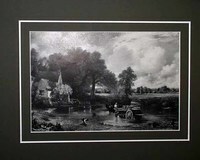 (unknown) This is a black and white illustration of a farm setting by Tim Cove. The publication and era is unknown. The print measures 7 1/2 x 5 inches and the grey matting measures 11 1/8 x 13 3/4 inches. Very nice condition. 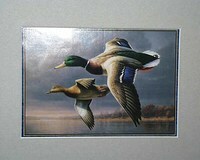 (unknown) This print is of flying ducks. 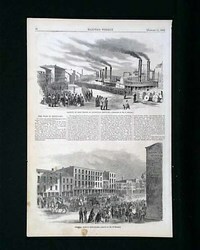 The publication and era is unknown. The print measures 6 x 4 1/4 inches and the grey matting measures 9 3/8 x 11 1/4 inches. Very nice condition. 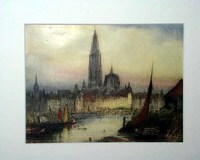 (unknown) This print is of a city with a river flowing through it. 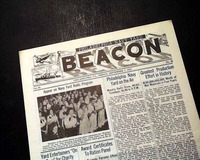 The publication and era is unknown. The print measures 6 1/2 x 5 inches and the linen matting measures 10 x 11 5/8 inches. Very nice condition. (unknown) This print is of a basket with flowers growing through it. 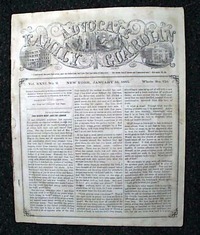 The publication and era is unknown. 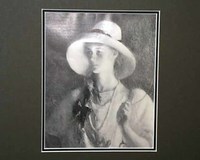 The print measures 7 1/2 x 6 inches and the tan matting measures 11 1/2 x 10 1/2 inches. Very nice condition. (unknown) This print is of a young lady. The publication and era is unknown. 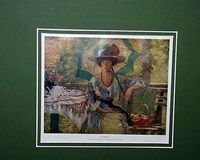 The print measures 5 x 6 1/4 inches and the dark green matting measures 10 1/4 x 11 3/8 inches. Very nice condition. 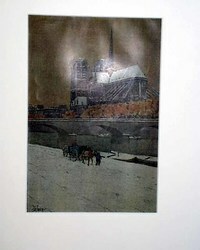 (unknown) This print is a winter scene of Notre Dame from along the Siene River. 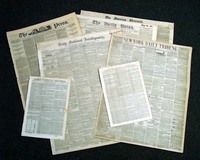 The publication and era is unknown. 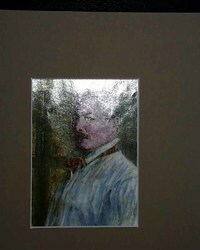 The print measures 5 1/4 x 8 inches and the linen matting measures 10 3/8 x 13 inches. Very nice condition. 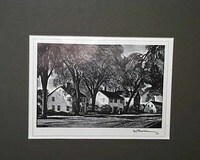 (unknown) This print is black ink of houses and trees. The publication and era is unknown. The print measure 6 1/4 x 4 1/2 inches and the green matting measures 9 1/2 x 11 1/4 inches. Very nice condition. 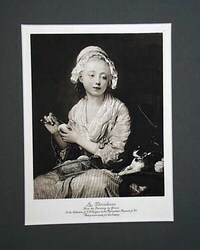 (unknown) This print entitled "La Devideuse" by Greuze is of a little girl with a basket of yarn and her kitten. 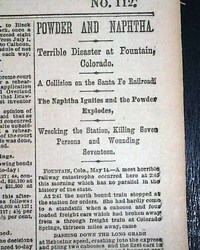 The publication and era is unknown. The print measure 5 1/2 x 7 1/2 inches and the green matting measures 9 1/2 x 11 5/8 inches. Very nice condition. (unknown) This print entitled "Summer" by Helen M. Turner and is of a lady with a parasail sitting outside. 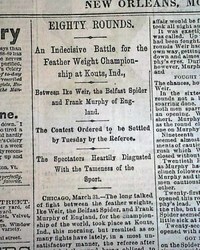 The publication and era is unknown. The prints measure 7 x 6 inches and the green matting measures 10 7/8 x 12 inches. Very nice condition. 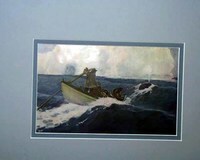 (unknown) This print is of whalers in a boat with a whale in the distance. 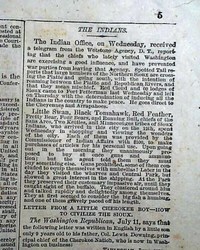 The publication is unknown. The print measure 7 x 4 1/2 inches and the bluish/grey matting measures 9 7/8 x 12 1/2 inches. Very nice condition. 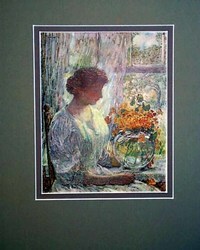 (unknown) This print is of a lady with a bowl of flowers. The publication is unknown. The print measure 5 x 6 1/4 inches and the grey matting measures 10 1/2 x 11 7/8 inches. Very nice condition. 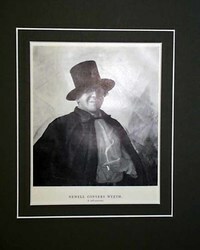 (unknown) This print by N. C. Wyeth is a self-portrait "Newell Convers Wyeth". 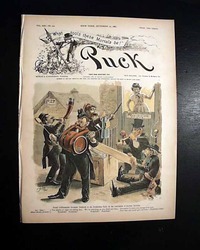 The publication and era is unknown. The print measure 5 x 6 1/2 inches and the dark grey matting measures 10 1/4 x 11 1/2 inches. Very nice condition. 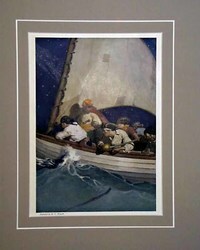 (unknown) This print by N. C. Wyeth is of a swashbucklers in a boat. The publication and era is unknown. 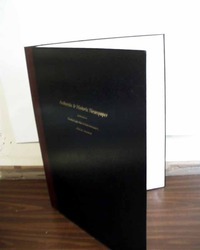 The print measure 5 1/2 x 7 3/4 inches and the tan matting measures 10 3/4 x 12 3/4 inches. Very nice condition. 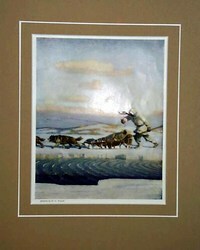 (unknown) This print by N. C. Wyeth is of an Eskimo with his dogs and sleigh. The publication and era is unknown. The print measure 5 1/4 x 6 3/4 inches and the tan matting measures 10 1/2 x 11 7/8 inches. Very nice condition. (unknown) This print by N. C. Wyeth is of a colonial men. The publication and era is unknown. The print measure 5 1/2 x 7 3/4 inches and the burnt orange matting measures 10 1/4 x 12 7/8 inches. Very nice condition. 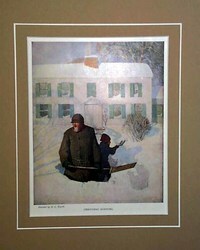 (unknown) This print by N. C. Wyeth is entitled "Christmas Morning" is of a father and son shoveling snow. The publication and era is unknown. The print measure 5 1/2 x 7 1/4 inches and the tan matting measures 10 x 12 1/8 inches. Very nice condition. 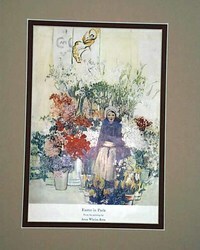 (unknown) This print by Anna Whelan Betts is entitled "Easter in Paris" is a lady sitting among beautiful flowers. The publication and era is unknown. 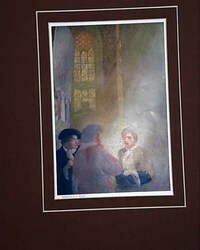 The print measure 5 1/2 x 8 1/4 inches and the tan matting measures 11 x 13 3/4 inches. Very nice condition. 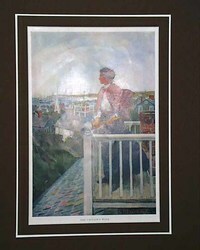 (unknown) This print is entitled "The Captain's Walk" is of a lady with an spyglass on a rooftop. The publication and era is unknown. The print measure 5 x 8 inches and the brown matting measures 10 x 13inches. Very nice condition. 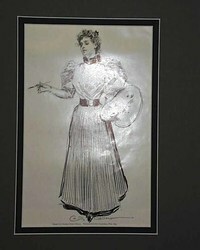 (unknown) This is an ink drawing by Charles Dana Gibson of a lady artist. The print measure 5 1/4 x 8 1/4 inches and the grey matting measures 10 3/4 x 13 3/4 inches. Very nice condition. 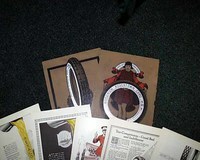 (unknown) This is a lot of two matted colored prints from unknown publications and time era. The prints are of a man and a woman. 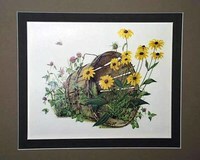 The prints measure 3 1/4 x 4 1/2 inches and the beige matting measures 7 1/4 x 8 3/4 inches. Very nice condition. 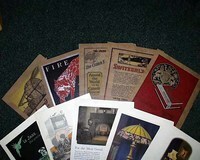 (unknown) circa 1922 and 1923 This is a lot of thirteen single-page advertisements from various publications measuring approximately 6 1/2 x 9 1/2 inches, all in nice condition. Suitable for framing. 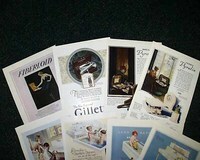 (unknown) circa 1922 and 1923 This is a lot of fourteen single-page advertisements from various publications measuring approximately 6 1/2 x 9 1/2 inches, all in nice condition. Suitable for framing. We have an assortment of used storage pockets which have minor defects due to being used. They are not damaged, but are not new. 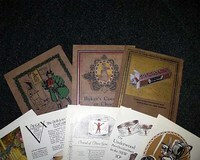 We have an assortment of portfolios which have minor defects (small scratches, dimples, glue yellowing, etc.) making them not fully first-rate. They are being offered at below 50% of retail value. 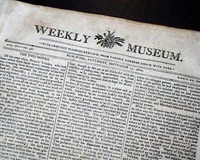 WEEKLY MUSEUM, New York, Sept. 13, 1800 Although there are some news tidbits, there is much literary content. Four pages, loss to a lower corner affects 2 words on the ftpg., minor upper corner loss, 9 1/2 by 11 1/2 inches. 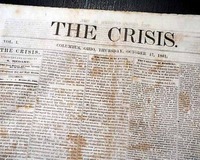 THE CRISIS, Columbus, Ohio, Oct. 17, 1861 Among the articles within are: "The Condition of Kentucky" "A Western Woman's Views of the Crisis" "The Prisoners of War..." "The News of the Week" "Bad News from Wilson's Zouaves" "News From Arizona" and much more. Eight pages, some foxing, never-trimmed margins, nice condition. 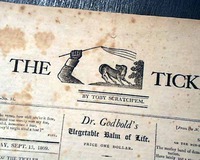 THE TICKLER, Philadelphia, Sept. 13, 1809 The masthead features a very unusual engraving of a dog and an arm holding a switch, & notes: "by Toby Scratch'em". Complete as a single sheet issue, bit of foxing, generally nice condition. Other news of the day. Complete in 8 pages, nice condition. 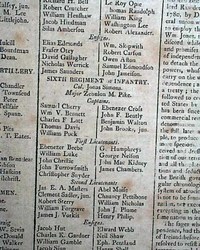 * Ike Weir "The Belfast Spider"
THE DEMOCRAT, Boston, Massachusetts, August 13, 1808 The front page has a "List of the Officers" which under the "Sixth Regiment of Infantry" contains "Major Zebulon M. Pike". 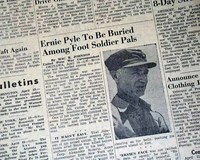 He also became an explorer and is whom Pikes Peak is named after. 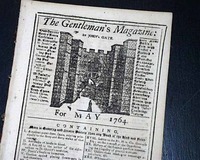 GENTLEMAN'S MAGAZINE, London, May, 1764 Among the articles within are: "Historical Account of the Canary Islands, Concluded" "Cures Performed by Using the Baths" of Bareges; "An Infallible Receipt to Destroy Bugs" and more. 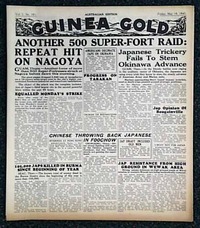 Near the back is the "Historical Chronicle" with has various news reports of the day.